Laguna Caliente often throws up the acid like a geyser – even hundreds of metres high! Laguna Caliente and surrounding fumaroles produce acid fogs and rains which have wiped out the vegetation near the summit. 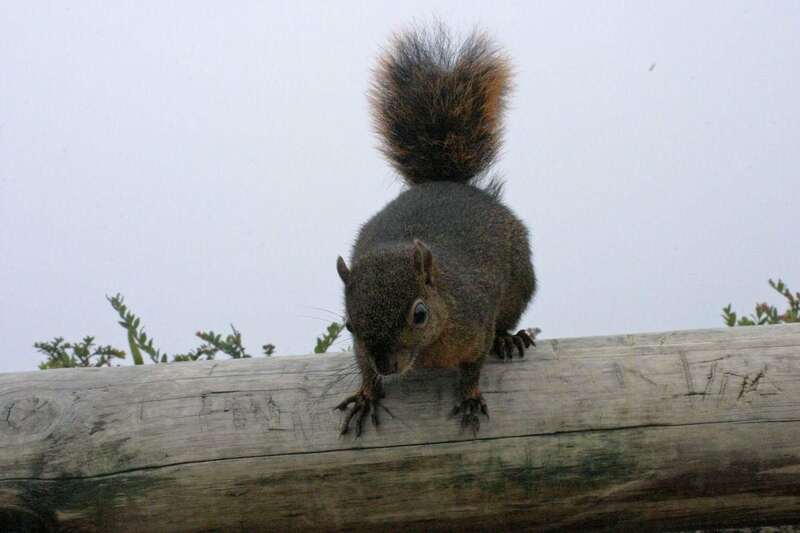 Part of the summit is covered with unusual, stunted forest, containing numerous rare and often visually impressive plants and animals including an extremely rare squirrel. Poas volcano is 2,708 m high stratovolcano – e.g. conical volcano made of material erupted by the volcano itself. Volcano is erupting diverse lavas – in this respect it is called basaltic-andesite volcano. Poas volcano is one of the most popular tourist destinations in Costa Rica with well developed tourism infrastructure and preserved by the Poas Volcano National Park (area 6,500 ha). Tourists are attracted by the unusual diversity of landscape: here lush tropical forest is located next to a lifeless landscape created by acid fog. Summit contains three craters with lakes. Here are also eight water-filled maars. Maars are created by spectacular phenomenon: as larger amounts of groundwater reached hot magma or lava, there rapidly formed a steam, virtually blowing up the ground and leaving a hollow which later filled up with water. Lower northern flank of Poás contains another volcano – Congo stratovolcano. 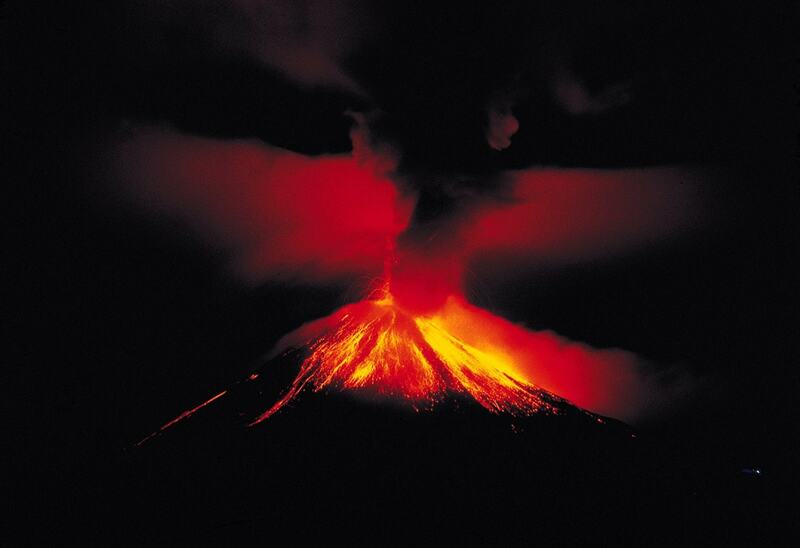 Poás is very active – there are known 39 pronounced eruptions since 1828, when the observations started. 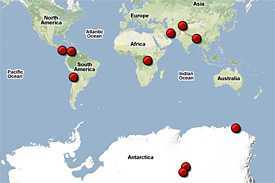 Last large eruptions took place in 1952 – 1954. 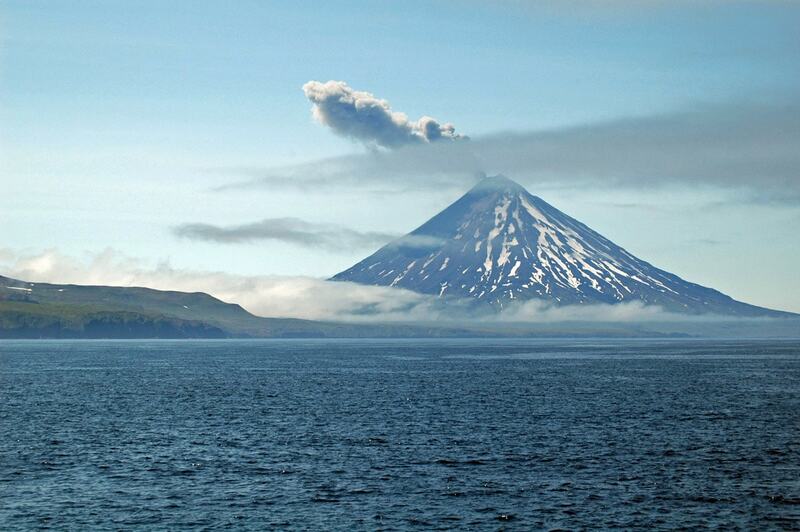 Some specialists consider that volcano is heading towards large eruption. But between the eruptions there is no calm either: almost continuously something interesting is happening here. In the southern part of the volcano is located Lake Botos – beautiful crater lake surrounded by impressive tropical cloud forest, located 870 m above the sea level. This is more ancient crater which last erupted some 7,500 years ago. For most part it behaves like a common lake but sometimes the water gets heated for several degrees by volcanic heat. 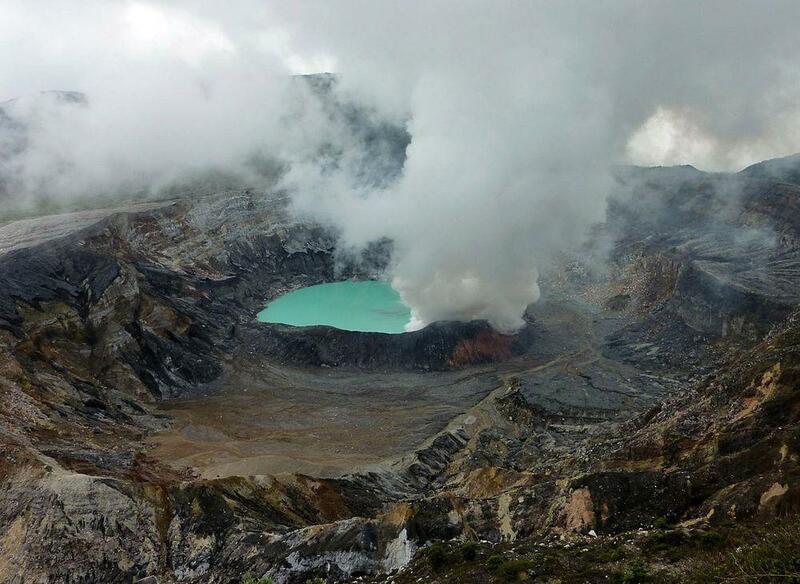 In the north is located the most interesting feature of Poas volcano – some 1.7 km wide and 290 – 300 m deep, active crater with Laguna Caliente – one of the largest lakes of acidic brine on Earth. This lake is located some 2300 m above the sea level, although the level is changing. Hot Lagoon (Laguna Caliente in Spanish) is one of the most acidic natural lakes in the world. pH of this lake often is close to 0 (for example in 1993, 1994 and 2000) and no aquatic life has been found in it. No wonder – in comparison the car battery acid is a lot less acid – around 1 of pH. Bottom of the lake contains a layer of liquid sulphur. Lake is very variable – sometimes 40 – 50 m deep, but sometimes it disappears entirely. Diameter of the lake may reach 250 – 300 m. Temperature of brine in it sometimes is 22°C but sometimes it rises up to 94°C. Fascinating is the diversity of colors of the lake. It might be emerald green but some three hours later – grey-whitish. Sometimes rafts of brilliant, yellow sulphur are seen floating in the lake. As if this is not spectacular enough – Laguna Caliente often experiences impressive phreatic and phreatomagmatic eruptions. This is caused by the magma reaching the water – extreme heat instantly turns the water and acid into explosive steam and the lake blows up like a giant geyser. Tourist booklets and Websites announce often that Laguna Caliente IS geyser. This is wrong – geysers are powered by somewhat different mechanism. Phreatic explosions in Laguna Caliente are very diverse. Thus on September 28, 1972 there was observed that the central part of the lake surged for some 2 metres and then fell back, causing large waves. Lake color changed from turquoise to dark grey. In the middle of December 1977 a column of water and mud was ejected more than 1 km high and then fell down, covering large area around the summit of volcano. Rather often phreatic explosions throw up the acid water more than 200 – 300 metres high. In 1978 – 1980 crater lake behaved like a giant geyser – for two periods of time it was periodically, some 9 – 50 times per day, ejecting ash and mud 5 – 300 m high. In August 1988 the geyser-like activity of lake took place every third minute, fountains were up to 30 m high. In March – April 1989 the lake disappeared completely, leaving pools of bright yellow, bubbling sulphur. At the southern side of the lake formed chimneys of sulphur which were emitting gases, some with a sound of jet aircraft. In April 1990 in the site of the lake were noticed up to 10 m high fountains of pure liquid sulphur, also bluish sprays of sulphuric acid. Five years later, in summer of 1995 the lake was back, sky blue, with comparatively low temperature and nearly clean water in it. It is noticed that every time, when the lake recedes, in the sites of geyser-like eruptions are formed yellow sulphur cones and chimneys with bubbling sulphur inside. On January 13, 2008 a group of tourists with awe looked at some 200 m high column of water and acid rising from the lake. A lake filled with acid is highly unusual – no wonder that there are unusual effects in the surroundings of it as well. One such effect is frequent acid rain and fog, eliminating the life in larger area around the lake. The acidity of rain is higher and more prononunced when the level of lake is lower – then more sulphur is blasted by fumaroles directly in the air. This shows that Laguna Caliente at high water is very efficient collector of magmatic gases. Elsewhere in the world the acidity of the rain normally is a bit more than 5.7 of pH. There are exceptions and the most extreme ones were created by humans: in Los Angeles there has been measured fog with acidity 2.0 of pH – this is similar to the acidity of lemon juice. Close to the Laguna Caliente the acidity of fog and rain is similar – around 2.0 of pH and may be even less. The ruling winds here are blowing to the west. As a result around the crater and to the west from it there has formed some 3.5 km long and 1 km wide, lifeless, naked scar surrounded by jungle. Effects of the volcanic acid rain extend far beyond this scar. One of such effects is "stunted forest". 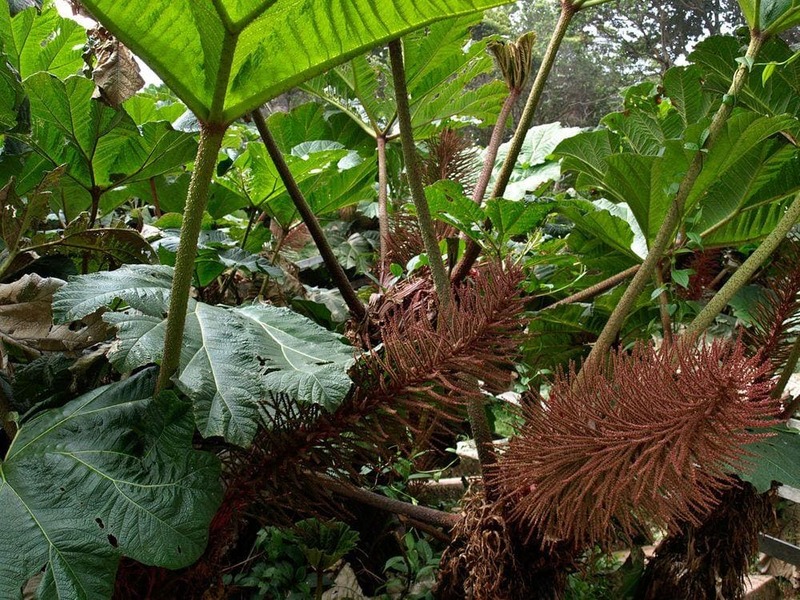 Diverse plants grow in the fertile volcanic soil under the otherwise favourable climate – but they frequently get sprayed with volcanic acid. As a result the leaves of plants are burned and shoots damaged and trees and bushes grow crooked and undersized. Unfortunately people living and working close to the volcano experience the effects of acid rain and fog too – and it may be far from pleasant. Acid rain has often damaged the crops and fruits in the vicinities of volcano. Due to the acid the farm equipment, cars and home untensils become rusty, roofs of the buildings are damaged. Often tourists have been rescued from the nature trails to avoid potential health problems due to acid fog – sometimes tourists have been running out of the fog coughing and with runny eyes. In April – October 1988 the acid rain consisted of small mud droplets covering everything in high density. Park guards experienced constant headaches, stomach problems and serious irritation of mucuous skin – happily there was no long term effect on their health. Dead birds were seen. Visitors of the park experienced eye and respiratory irritation. In January – June 1989 toxic and acidic fog brought suffering to the inhabitants of nearby towns – they suffered from eye and throat irritation. Acid fog covered cars and houses with fine sulphur dust. In March 1992 the acid dust impaired the vision of people in the vicinities of volcano and in May – July 1994 caused extensive damage to fields, forests, cars. 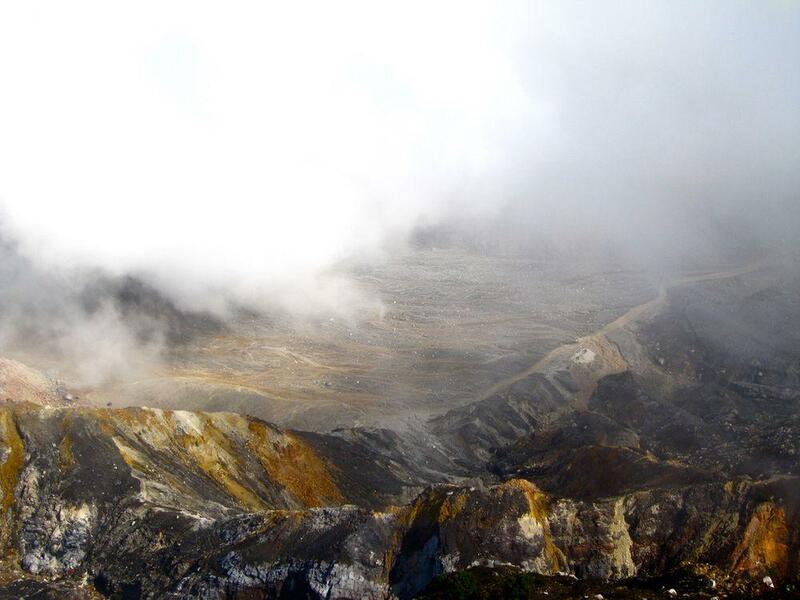 In spite of this extreme and rare meteorological phenomenon the surroundings of Poas volcano are covered with lush, very diverse tropical forest. Numerous rare and exotic species of plants and animals are found here. Acid rain has created a unique biotope southwest from the Laguna Caliente at the height of 2,500 – 2,600 m. This biotope is disturbed by the acid and this has led to much lower species diversity in this location. The trees here look like bonsai, are low, on some areas here totally are missing bromeliads which elsewhere are very common. Forest canopy here is not continous. Exactly in this place is observed a very rare squirrel – Bangs’s mountain squirrel (Syntheosciurus brochus Bangs, 1902) – often indetified as a susbpecies – Syntheosciurus brochus poasensis. This animal is found on the mountain rain forest of three volcanos – two in Costa Rica and one in Panama. Here, on the summit of Poas volcano it is the most frequently seen animal. This small Central American country offers numerous beautiful natural monuments as well as some exciting archaeological monuments. 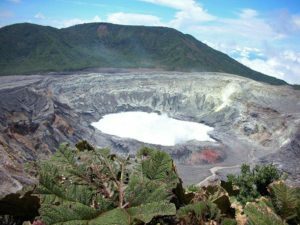 Highlights of Costa Rica are interesting volcanic features, extremely high biological diversity and unusual archaeological monuments, such as enormous stone balls. 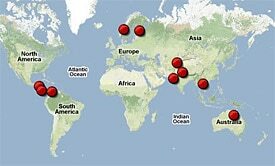 This impressive scientific resource presents up-to-date information on ten thousand years of volcanic activity on Earth. In the decade and a half since the previous edition was published new studies have refined assessments of the ages of many volcanoes, and several thousand new eruptions have been documented. This edition updates the book’s key components: a directory of volcanoes active during the Holocene; a chronology of eruptions over the past ten thousand years; a gazetteer of volcano names, synonyms, and subsidiary features; an extensive list of references; and an introduction placing these data in context. From pristine beaches and jungle waterfalls to high-altitude coffee plantations, Costa Rica: The Complete Guide puts the very best of Costa Rica at your fingertips.